Marana Rian is an Imperial agent and the master trainer in Sneak. Marana believes, somewhat arrogantly, that the Temple District is the most desirable address in the Imperial City simply because she lives there. She will offer to train you only if you manage to steal a coin from her pocket. Marana is a bit of a night owl, sleeping from 6am to midday in her luxurious house in the Temple District. She will immediately exit her house and take the northwest road up to The All-Saints Inn for a two-hour breakfast before returning home at 2pm. At 6pm she will go outside to meet up with Ancus Afranius, and at 10pm she will travel to the Arboretum for four hours of reflection. She will then take the tunnel to the Waterfront and spend six hours skulking around this rough part of the city, only heading home when the sun begins to rise. The only exception to this schedule is during Light the Dragonfires, when the Temple District is attacked by Mehrunes Dagon and she and the rest of the inhabitants of the Imperial City are confined to their homes under martial law. During her normal routine, she will offer training to you as long as she is not eating or sleeping. She wears a blue velvet outfit and a pair of blue suede shoes. She carries her house key and a large amount of gold. Speaking to Marana for the first time will have her greet you by telling you her name, and a bit about her lifestyle: "Marana Rian. I am very fond of nice things. How fortunate that I can afford them." Asking her about the Imperial City will have her make further claims about the grandeur of her life: "The Temple District is by far the most desirable address in the city. Why? Because I live here, of course. Don't you agree?" The two advanced trainers for Sneak, Mirabelle Monet and Othrelos, will point you toward Marana for master training. Mirabelle will claim that Marana is a master of the shadows when she gives you her reference to Marana: " If you need more assistance with your training, seek out Marana Rian in the Imperial City. She uses the shadows like no other I've seen." Othrelos will also direct you to the Imperial City with the words: "You want more training? Then you'll have to go to the best. Marana Rian, here in the Imperial City. She can help you better than I." 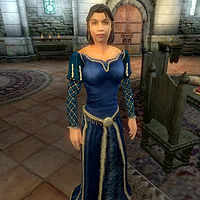 Once you have learned about Marana's unique abilities, both trainers will briefly mention her again when asked about training: "Find Marana Rian in the Imperial City. She can teach you what you wish to know." Asking Marana Rian for Sneak training will have her reveal her secret skill set, and a promise to train you if you prove yourself to be a worthy student: "Training? From me? A few too many loose lips, it seems. It's not something I want to be public knowledge, if you understand my meaning. Very well. Simple task for you. I just dropped a favorite coin of mine into my pocket. If you can steal it from me, I'll train you." Asking her for Sneak training again before you steal her coin will have her once again deny you training until you succeed in the task she gave you: "You don't have my coin, so you don't get any training. I haven't changed my mind." Once you successfully steal the coin from her she will agree to train you: "Well, there it is. Not the best job I've seen, but you did it. All right, I'll help you hone your technique." Her meeting with Ancus Afranius is supposed to last six hours, but is cut short by two hours when she takes her daily trip to the Arboretum. Marana is a member of the Bravil Faction but will never travel to the town at any point in the game. She may have originally been intended to be a traveling NPC as an unused package called MaranaRianVisitBravil exists in the game data. This package would have caused her to travel to Silverhome on the Water on the 10th of each month. This page was last modified on 31 January 2018, at 23:07.